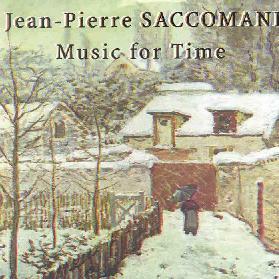 Jean-Pierre Saccomani - "Music For Time"
Jean-Pierre Saccomani is a French solo music performer and this CD was recorded in Paris in 2000-2001 and is a series of 6 music soundscapes. "Cold Scene" starts off very haunting and builds up and then suddenly lets flow a free peaceful atmosphere that then drones on. Pretty spooky. I am guessing the music is mainly composed on synthesizers and uses samplers but there are no details. For more information you can email Jean-Pierre Saccomani at jean-pierre.saccomani@wanadoo.fr.